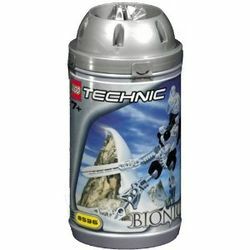 8536 Kopaka is a BIONICLE set released in 2001. The set features the Toa Mata of Ice, Kopaka, as well as a collectable Kanohi mask. Turning the gear on his back will cause his arms to rotate. Kopaka wears a white mask with three lens of different sizes in place of a right eyehole. There is an angled slit on the right side, however, revealing the transparent light blue colour of his eyes. Kopaka's body is white shaped roughly like a V, wiht a black ball commonly used for joints in the centre of his chest. Due to a pattern of cogs around his neck, Kopaka's right arm, that which holds his sword, can swing forward and backward by twisting a gear on his back. The arm is light grey and is curved slightly. It has no hand, but instead a socket in which the sword is placed. This ice blade has two holes near the hilt and has a split running down it's length. Kopaka's shoulders are black. His left arm is light grey and shaped like an L. His hand piece is also black and is the same as the shoulder piece. Connected to it is the frame of a white disc; his shield. The pieces connecting Kopaka's legs to his body are the same as that of his shoulders and left hand, in both shape and colour. His legs are made up of one piece, a light grey one bent slightly at the point where the knees would be. His feet are white and blocky, with shaped holes in the sides that can house rods or pegs respectively. Kopaka first awoke on the island Mata Nui after drifting in the sea for a thousand years in a canister, summoned to the island unwittingly by Takua. He almost immediately met Matoro on the bleak shore of Ko-Wahi. He was brought to Turaga Nuju in Ko- Koro, and was told the story of the Great Spirit mata Nui, Makuta, and his mission to recover (alongside 6 other Toa) each a great Kanohi mask. When finding the Mask of Strength on Mount Ihu, he met fellow Toa Pohatu and encountered a Kane-Ra bull. He recovered the mask and he and Pohatu then found the other assembled Toa. Despite Lewa's humour, Gali's optimism and Tahu's anger he agreed to work with them. Later, while recovering a Kanohi Mask in Ta-Wahi, he was hit on the head and had a vision about Toa Kaita Wairuha. After collecting the Great Masks, he, along with the others was granted a Golden Mask of his original type, granting them the power to combat Makuta. After merging with Gali and Lewa to form Toa Kaita Wairuha and defeat the Manas, minions of Makuta. After defeating the Shadow Toa conjured by Makuta, the Toa then left his lair and emerged in Ta-Wahi. After emerging in Ta-Wahi, the six Toa were immediately flung into battle with the Bohrok swarms assaulting Ta-Koro. The Toa then split up to collect the eight breeds of Krana and defeat the Bahrag queens of the Swarms. later, in the mountains of Ko-Wahi, Kopaka discovered that the Bohrok were coming out from underground. Later, the Toa traveled underground and were confronted by the Bahrag in a vast cavern. After a fierce battle, the Toa sealed the Bahrag in a protodermis prison, before being sent down into a pool of liquid protodermis. They then emerged as the new Toa Nuva. As a Toa, Kopaka preferred to work alone. When meeting Pohatu, Kopaka only agreed to work together after their encounter with a Kane-Ra. Kopaka hated Tahu, who once called him 'The Toa of Doing His Own Thing'. Kopaka also rescued Tahu from the Bohrok nest; simultaneously destroying it. Kopaka could be a powerful ally at times. 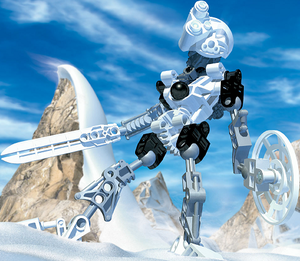 As a Toa, Kopaka carried an Ice Sword that could freeze any substance it touched. He also carried and Ice Shield that doubled as a snowboard. He wore the Kanohi Akaku, the Great Mask of X-Ray Vision. The white sword part from this set was also seen in 7136 Skrall from BIONICLE Stars, and 8594 Jaller and Gukko, though in different colours. 1393 Matoro had the same mask, but in sand blue. This page was last edited on 15 March 2016, at 06:17.